You'll start noticing Positive changes from day 1. Allah says a lot of things that Christianity says! Last Messenger (SAW) did not know how to read and write. Do you have any Rumi? I think he studied Islamic mysticism called Sufism. This isn't my faith, I am Jewish. but I love reading quotes from Rumi. Once of my faviroutes was "Knocking at a door, it opens, I was knocking from inside!" Great stuff. ﻿This isn't my faith, I am Jewish. but I love reading quotes from Rumi. Once of my faviroutes was "Knocking at a door, it opens, I was knocking from inside!" Great stuff. To tell you the truth I am pretty down, I find philosophy very hard to understand, but when I read the Quran's translation I find it easy. Where things are not that easy and I don't know the background of the verses I read the Tafsir and it becomes easy. Tafsir goes through the Quran in the light of Sayings of the Prophet(SAW) in accordance with Quran's command "Obey Allah and Obey the Messenger". Arabic is very accurate, I have to study more about it but its grammar is unlike any other language, for example the "they" in Arabic is different for masculine, it is different for the feminine and it is different where both are present. And yes you don't have to go find the word "Allah", it is there written on our hand, all 5 fingers together read Allah. Then again, what good a good health is if the man keeps away from his Creator ? Really? I didnt know. How do you write "h" in arabic? I know that ala is "lll" and there is missing h.
Yes, the artist is our Creator Himself ! How do you write "h" in arabic? I know that ala is "lll" and there is missing h.
It is Allah in Arabic. As you start to walk out on the way, the way appears. ~ Rumi Sorry i had to add this one to the collection. Let me know if it is innappropriate, I don't know the compatibility of Sufi's, and Sufism in Islam but i have respect for this scholar. 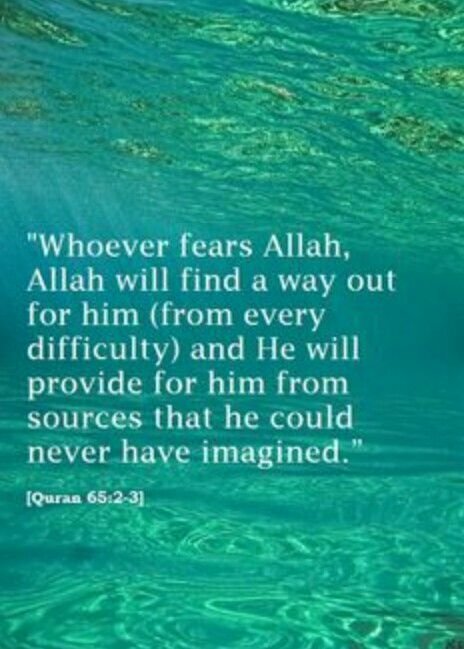 And this is why I listen to / read the Quran, I believe it keeps me going on, Ma-Sha-Allah. While listening to the music I feel good, but later I feel drained, this is not the case with the Quran. The Prophet (SAW) said, "Every Muslim has to give in charity." The people asked, "O Allah's Prophet! If someone has nothing to give, what will he do?" He said, "He should work with his hands and benefit himself and also give in charity (from what he earns)." The people further asked, "If he cannot find even that?" He replied, "He should help the needy who appeal for help." Then the people asked, "If he cannot do that?" He replied, "Then he should perform good deeds and keep away from evil deeds and this will be regarded as charitable deeds." Ather, it would be most appropriate to the discussion on this site if you would talk more specifically about how your faith has impacted your life, and especially your withdrawal experience. What related topic, do you mean your introduction? Are you opposed to discussing your faith here in this topic, along with the many religious quotes you have posted? I know that this thread was created for you, and we're open to discussions of faith. Your frequent postings without discussion or asking about others' experiences are bordering on the following. Ather, you are a kind person, you have been generous with your encouragement and prayers for others. Thank you for that. Please be aware people follow many faiths on this site and some follow none. We don't require people to disclose their faith. To avoid offense, we generally discuss religion only in the Finding Meaning forum. This is an interesting topic, please add to it. Thank you. @SkyBlue I am open to discuss my faith Islam anytime Bro, including the Verses I have posted, they are very clear by the way. @Altostrata Thank you for your kindness, again ! I have a question shall I share a Sign that I got some time back, it is very powerful, 1 in 10 million to be exact, I got it when I was asking for a Sign, day in and day out in my prayers, I never thought a man like me (very sinful) can get it. The accuracy in it is phenomenal, some day when I have the courage to, I'll share, if God wills. 4. And no sign comes to them from the signs of their Lord except that they turn away therefrom. 7. And even if We had sent down to you, [O Muhammad], a written scripture on a page and they touched it with their hands, the disbelievers would say, "This is not but obvious magic." 9. And if We had made him [i.e., the messenger] an angel, We would have made him [appear as] a man, and We would have covered them with that in which they cover themselves [i.e., confusion and doubt]. 152. So remember Me; I will remember you. And be grateful to Me and do not deny Me. Another moderator, SkyBlue, has already posted about your lack of discussion about the effect your faith is having on your life and about how it helps you through your journey of getting off psychiatric drugs. This forum is entitled "Finding Meaning". Quoting surah/s from the Quran without any discussion by you about how you specifically find the quote helpful related to your own life and/or how it helps you with your tapering/withdrawal experience is not providing anything for members to discuss. As I read it, Ather is quoting verses he's found meaningful in his life. Ather, we'd like to know more about what these things mean to you. Your contributions are welcome. "Remember Me and I will Remember You"
Is it ok now sis ? Thanks, Ather. You find these verses soothing, is that correct? That day I was trying to understand what Almighty was saying to me in the Quran. And then this Sign (Verse) hit me really very hard, specially at a time when I was thinking "Is there anybody who understands my condition?" "And indeed We already created man, and We know whatever his self whispers within him, and We are nearer to him than the jugular vein." Goosebumps followed by comfort, specially when you think of the Might of your Creator....... woh you don't have words to explain !! And then when it is told again and again to be patient, take patience, repeated so many times, just like our parents keep repeating things again and again so we make them a part of our self, Patience is a thing repeated again and again in the Quran. And yes I also want to tell you a very important thing about Quran, there is not a single word less and there is not a single word in excess, every word, even every "letter" is precisely, accurately, put at a place it should be, Mathematically too. One day I will try to share something that I have been blessed with, it is a Sign so powerful I don't feel the courage to share, given to me in my hand, and it is very deep, new things keep coming out of it. It has made my faith strong, strong to a degree that I do not have to See God to believe in Him, I have already seen His work, it is Precise. After that Sign, I now know that Nothing, absolutely nothing happens without a reason, not even a microscopic particle moves without a reason. Our intentions matter a lot ! That is lovely. Thank you, Ather, for your willingness to comfort people in our community here. we used to joke that when we pray for patience, we are given a trying situation in which to learn that patience. I think WD/recovery sure seems like one of those very trying situations that help teach us patience- and acceptance too.